White water kayaking demands quick reactions and strong boat control skills. White water kayakers seek out rapids and other fast flowing water, testing their skills whilst also exploring what can be very remote rivers. White water kayaking is a popular sport, with many London clubs active in the sport, despite the capital’s distance from most good white water rivers. White water is graded from one to six, depending on it’s severity. Grade One water is easy, moving water with only slight waves or disturbances. Grade Six water is almost always too dangerous to paddle, and even when water levels are ‘right’ there will be a serious risk to life. Few kayakers ever attempt Grade Six water. 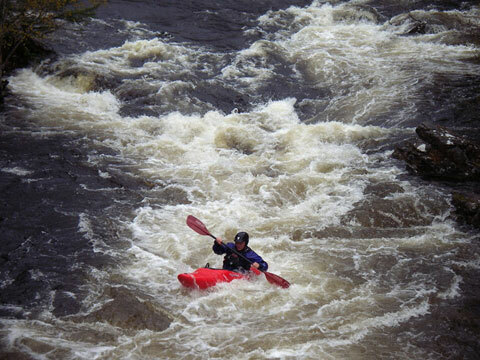 White water kayaking in the UK is very seasonal, as the winter rains are needed to fill the rivers with enough water. As with all recreational canoeing, access to rivers can be a problem, with some landowners attempting to prevent access, even in the remotest of areas. This is a problem almost unique to England and Wales. In most countries, including Scotland, rivers are open to the public to enjoy. For more information see the Rivers Access page. Top white water destinations are the rivers of Dartmoor, the Lake District, North Wales and Scotland, although there are many other beautiful rivers across the UK. Londoner white water kayakers also have the fantastic facilities at the Lee Valley White Water Centre, where the Olympic and Legacy courses provide pushy Grade Four and Grade Three white water kayaking. A competency test is required before paddlers can kayak these courses. London’s white water kayakers also use the rapids below some of the Thames weirs in west London, when the river is high enough. Please note that all weirs can be extremely dangerous and should not be approached unless you are an experienced kayaker who understands weir dynamics and water flows. Always paddle with friends in case rescue is needed. White water coaching is widely available from canoe coaches across the UK. See Canoe Lessons for a list of canoe courses and training in the UK. For more information on White Water Kayaking, please use the following links.